To enhance your vacation experience we empower you to design the best vacation for you. We offer additional shared & private luxury charters through our preferred partners. Set Your Soul to Roam with these unique experiences. After booking your seats on the 8-Day Taste of NZ Elite or Gold Paradise Mega-Tour, review these special invitations at your leisure. When you are ready click BOOK NOW to add them to your vacation. Where pricing is not listed please contact us to refine & design the VIP experience you are looking for. Upon request - a private video-photographer can be booked to join you for one day or eight to capture these treasured moments. Create a memorable tour experience from the air and get an appreciation of local history, culture and the coastal environment that is uniquely Northland. 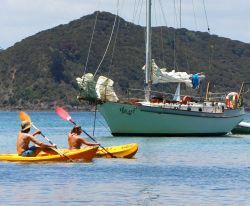 Want to experience the best of the Bay of Islands all within one day? 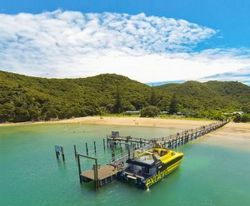 The Heli Cruise Island Escape package allows you to experience a boat cruise between Paihia and the islands, an island beach stop over and a scenic helicopter flight. October-March. - $350pp. Duration 4 hours. Shared charter. Offers exceptional views of beautiful islands leading to the infamous “Hole in the Rock”. Fly directly over the main islands of the area with a bird's eye-view of white sandy beaches, inviting turquoise waters and luxurious private residences. - $250pp. Duration 20mins. Shared charter. For the first time in New Zealand’s history, an unforgettable adventure to set foot on top of the iconic Hole in the Rock – Land on Motu Kōkako, a profoundly moving experience. - $430pp. Duration 45 minutes. Shared charter. Designed by American course architect Tom Doak, Tara Iti has a case for the greatest meeting of land and sea in all of golf. It is laid out amid the white dunes of the Northland. Since opening in 2015 it has emerged as one of the world's must-play courses. 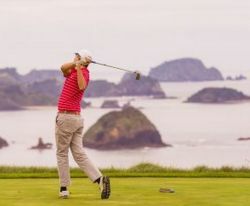 "A golf oasis on the other side of the world," Golf Digest. Please note a letter of introduction is needed from your home club to accompany all bookings. Please call us for more information as seasonal prices vary for this most private venue & privileged invitation. Read more. One of the most sought after luxury lodges in the world houses this 18 hole course that features ocean views from 15 holes, with stunning vistas over the Pacific Ocean and offshore Cavalli Islands. Play alongside cliffs which plunge to the sea. The beautiful inland holes wind through marsh, forest and farmland. Currently ranked #39 in the world by Golf Digest Top 100 Greatest Golf Courses in the World. Read more from our partners. Please call for more information as seasonal prices vary. From $550pp. Duration 5 hours. Escape on your unique fishing adventure in the magnificent Bay of Islands. A personal guide will take you to the hottest fishing places. High quality fishing gear is there to optimize your experience. Safe and professional skippers will ensure a dazzling adventure! 1- Private Snapper Charter: Catch your dinner! Join the crew on a half day fishing trip, morning or afternoon! They fillet the fish nicely for you to bring to the restaurants that will cook your catch! 2- Private Kingfish Charter: Starting at sunrise you will be catching live bait, then time to go chasing the Kingfish, small game but a big fighter! Just amazing. 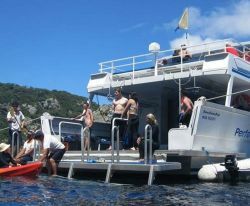 - $1,500 per group: 1 - 4 persons then $100pp up to 8 persons. Duration 6-7 hours. - $2,000 per group 1 - 4 persons. $550pp on a shared game day. Duration 12 hours. Make this yacht yours for a day by requesting an exclusive charter on this elegant vessel, a customized sail just for you giving a cool change. 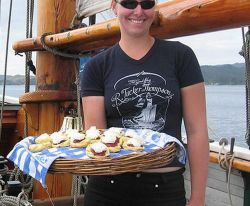 Enjoy sailing through one of the world's most beautiful cruising grounds and a gourmet lunch with beverages. Swim or snorkel in crystal clear waters and wander along white sand beaches. Leaving early afternoon returning in the evening. From $350pp. Please call for more information as prices vary. Duration up to 6 hours. Afternoon scenic coastal flight for an hour by helicopter to board an authentic America’s Cup yacht at 2pm. 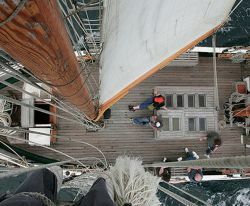 Have a unique and amazing opportunity in the thrill of sailing with the crew for a few hours. Dine in the Basin or fly North to a more secluded island spot then ferry back. November - March. 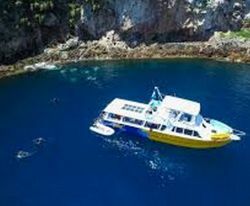 Poor Knights Islands; “the best sub-tropical diving in the world”. 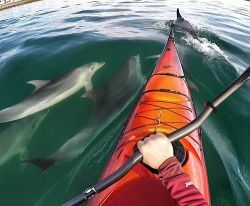 They are a group of islands 23km off the east coast of the Northland Region. Beneath the waves are caves, arches, tunnels and sheer cliffs provide a great variety of habitats to explore. Jacques Cousteau rated the area as one of the top ten dives in the world! It is an international icon. Dive! 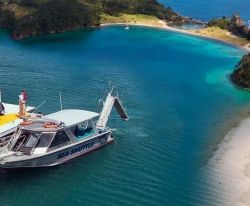 Tutukaka is New Zealand’s premier full-service dive charter operator and will deliver a world class experience to you. - $2,050 for group of 4 people. Guests must bring AOW Padi diver certification. This sheltered harbour is the gateway to the Poor Knights Marine Reserve and the white-sand beaches of the Tutukaka Coast. 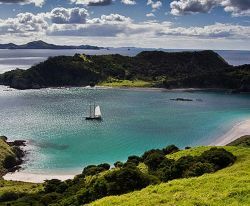 Located east of Whangarei, the Tutukaka Coast was rated as one of the top coastal destinations on the planet by National Geographic Traveler. - $1,000 for group of 2 people. - $1,200 for group of 4 people.